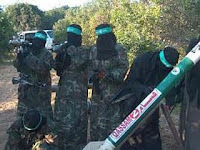 Palestinian terrorists operating out of the Gaza Strip fired a Grad-type short-range missile at the Israeli coastal town of Ashkelon on Sunday, as observers warned that Israel’s deterrence is eroding. Two people were treated for shock following the Ashkelon attack. Earlier on Sunday, two Kassam rockets and a mortar shell hit another nearby Israeli community. On Saturday, Gaza-based terrorists significantly escalated the situation when they fired no fewer than 50 mortar shells at farming communities in southern Israel. At least one Israeli was wounded by shrapnel. Israel invaded the Gaza Strip in December 2008 following a major escalation of Hamas-led artillery attacks on southern Israel. Since that brief war, which Israel was harshly criticized for, military officials have been warning that the next Gaza war is only a matter of time. The reason is that the international community is all to ready to jump on Israel’s back for defending itself, but does little to nothing to curb the provocative attacks that eventually necessitate an Israeli response. And Hamas knows this all too well. The December 2008-January 2009 Gaza war, dubbed Operation Cast Lead, dealt a heavy blow to Hamas and its terrorist allies, and they are likely not ready for a repeat just yet. But commentators in the Israeli media are warning that the IDF’s deterrence is eroding, as it always tends to do when the enemy is left to fight another day. And the next time Israel must enter Gaza, the price on both sides is likely to be much higher. Every time Israel directly engages the terrorists, they, the terrorists, learn how to better kill the Israelis. In the next Gaza war, it is widely accepted that Israel will face more defensive obstacles, more advanced weaponry and even more sadistic exploitation of the civilian population as a human shield.